This month has been hectic for CDP market, especially with large enterprise software vendors jumping in. Informatica bought AllSight and then Adobe and Salesforce announced their CDP offerings. We'll have more to say in a bit about Adobe, but this post is about Salesforce. I am excited to share today that Salesforce is building the first enterprise-grade Customer Data Platform. To be fair, Salesforce already ticked a number of checkboxes to qualify as a CDP vendor. They didn’t have a dedicated offering, but they did provide a number of CDP-like capabilities. They have been acquiring vendors to fill some gaps: Datorama (which we already cover in RSG's CDP vendor evaluations), MuleSoft, and more. The vendor also announced "Customer 360" last year. This initiative tries to bring together customer use profiles from Salesforce Marketing Cloud (ExactTarget), Sales and Service Clouds, along with Commerce Cloud (Demandware). 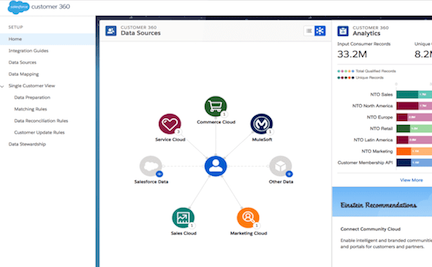 Customer 360 provided a way to map customer records across these Salesforce platforms to a unique customer id. It did not copy all data to one place but it did the stitching. The newly announced CDP offering will supposedly build on and extend Customer 360 to provide a more complete environment. The CDP market is evolving very rapidly. One category of vendors It includes are mostly smaller upstarts (we cover the most important among them in RSG's CDP evaluations). These vendors provide specialized CDP offerings, mostly targeted at marketers. Although several go beyond marketing-oriented scenarios, most of them focus most intently on supporting outbound campaigns and personalization use cases. The other category of vendors are the traditional, big martech software vendors: IBM, Adobe, Salesforce, and Oracle. While they all provided several CDP-like features (which is why we cover them in our CDP research), for some reason, they didn’t want to use the CDP moniker to describe their offerings. Salesforce finally embraced it, and so did Adobe (that will be my next post). In terms of functionality, these platform vendors are more complex and seem poised to target broader range of use cases beyond marketing. For the industry, big vendors coming around shows this category is becoming increasingly important. More investments might follow. As always, you should not assume that Saleforce and Adobe CDP offering will lead to industry consolidation; nor should you assume that the smaller, more focused players will suffer. The pure-play CDP vendors remain more agile and more platform agnostic. They are also not beholden to supporting legacy engagement stacks. If you are a Salesforce customer or potential customer evaluating Salesforce offerings and (plan to) use more than one of their “Clouds” — Marketing Cloud, Sales/Service Cloud, Commerce Cloud — you probably know the same customer record is stored in different ways across those platforms. In fact, the three systems deploy with totally different data stores and architectures. So when you encounter a cross-cloud use case (such as relating a transaction in the marketing cloud to a transaction in commerce cloud), it was a non-trivial effort to pull together the customer profile from different clouds. You needed a way just to tie together data from Salesforce’s own offerings. Customer 360 was a good move and now this extension of that model by supposing a persistent customer datastore underneath the rest of Salesforce can only be good news. Just note that the new CDP is not due to be released until later this year. At this point, details remain sketchy. One big consideration is the extent to which it will support non-Salesforce data. Presumably Salesforce will leverage Datorama and other integration toolsets here, and that could affect your licensing. Watch this space for more commentary on CDPs as well as adjacent marketplaces such as Journey Orchestration Engines and other omnichannel technologies. I see a lot of flux, especially due to overlapping features and sketchy boundaries between different types of data and engagement management offerings. Enterprise architects and stack owners at large enterprises will want to remain focused on maintaining clear separation of concerns. If you are trying to make sense of these, RSG can help. Check out our CDP evaluations or contact us for our forthcoming evaluations of Journey Orchestration Engine vendors. What Does the IBM Sell-Off Mean for the MarTech Marketplace? Do CDPs Need to Be Marketer Friendly? Is Salesforce the New SharePoint? Customer Data Platforms - If It's EAI for Marketers, Where Are the Big Vendors? Apoorv Durga covers ECM, Portals, Digital Marketing, Social Media Monitoring, and Mobile technology. Try a Free Research Sample. Get a sample Customer Data Platforms vendor evaluation. Pick the right vendors. Improve your effectiveness. Get the right vendor shortlist based on your unique requirements. Compare vendor weaknesses and strengths, head-to-head. Benchmark against competitors and visualize where to go next.